Brittany and her husband struggled to become pregnant for years. When she got pregnant with their son Max, they were ecstatic. During a prenatal ultrasound, doctors found a multitude of problems, including a club foot, heart abnormalities, missing brain matter, and Hydrocephalus. Doctors also found that Brittany had Amniotic Band syndrome where fibers from the amniotic sac break off and wrap around or attach to the baby. Brittany and Tyler found themselves terrified and heart-broken. The list of Max’s complications was a lot to take in. “I remember feeling that we were going to be okay and there was this sense of peace,” Brittany said. Doctors needed to do an amniocentesis to see if Max was genetically compatible with life. Results showed no chromosome abnormalities so Brittany, Tyler, and doctors devised a plan to give Max the best chance at life. For the next couple of months, Brittany had weekly appointments to monitor Max’s stress levels. Once it was time, they planned to have him born at the University of Utah hospital then go to Primary Children’s Hospital. Max was born via c-section. He needed resuscitation and then intubation right after being born. Because of this, Brittany wasn’t able to see Max until a few hours later. Before taking him to Primary Children’s they brought Max and his incubator into Brittany’s room. She held his hand and he squeezed her finger while looking at her with his one good eye. “I just couldn’t believe that he was here and that he was alive,” Brittany said. The first thing Primary Children’s Hospital did for Max was doing an MRI. Doctors needed to see what they were dealing with as far as brain matter and what complications to expect. Results showed only small strips of brain matter had developed. More concerning was that parts of his brain stem were missing. The most basic human functions come from the brain stem and without it, Max would never be able to do those things on his own. “We went ahead and made some decisions to try to extend our time with him as best we could,” Brittany said. At five days old, Max had his first neurosurgery to lessen the amount of fluid around his brain. A couple of days later, Max became stable enough to be held for the first time. 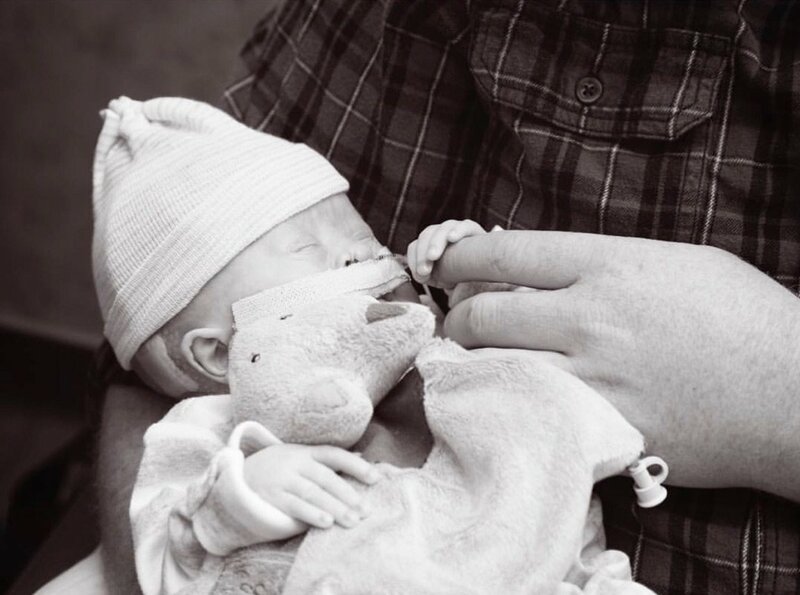 “I didn’t know if I would ever get to hold him and to be able to do that was incredible,” Brittany said. The next day, Tyler got to hold him. They were only allowed to hold him for 15-30 minutes at a time so these moments were cherished. Max’s second surgery was to put in a shunt to make him feel more comfortable. Unfortunately, Max got an infection at the shunt site in his abdomen. He was really sick for a couple of days until the antibiotics started working. “He was happy and doing well again, and he was even starting to breathe over his machine,” Brittany said. A few days later, a blood draw showed Max was not doing well. His body was full of infection and he was developing meningitis. There was nothing more the doctors could do. Max lived an amazing five weeks before he passed away. “Despite all the hard things, there were so many good moments and good days,” Brittany said. Two days, in particular, stand out to Brittany and Tyler. Max usually opened just one eye because his other one was underdeveloped. But Max opened both eyes the first time Tyler held him. The second best day came at a time when Brittany was discouraged. She didn’t know if Max knew who she was, could see her or even missed her. “I desperately wanted to know if he really knew me and his dad,” Brittany said. Then one day, she got a resounding confirmation that despite all his medical complications, Max did know and love his parents. That day when he heard their voices he started kicking, waving his arms around, and had a huge smile on his face. That experience was so special for the two of them because it was the next week that Max passed away. “No amount of loss and heartache could ever take away the joy that he gave us,” Brittany said. When you have a baby that is diagnosed with numerous medical complications you will mourn for your child. “No matter what happens, don’t give up and don’t lose hope,” Brittany said. Max defied the odds and did things that doctors never thought he would be able to do. He breathed over his oxygen machines and he moved around when he should have been immobile. When you put your faith in God as well as your child, miraculous things can happen. “Know that they are never going to stop being your child even after you’ve lost them and that if you do lose them, you will be okay,” Brittany said.